Want to sell mobile phone footage to the press? You’re in the right place! If you have some amazing mobile phone footage, we want to hear from you. To sell mobile phone footage, simply fill out our Story Valuation form to tell us a little bit about your video or story. We’ll let you know if it’s something we could place in the national press. As the largest press agency in the UK, we guarantee the highest fees. Cuddling up on the sofa with my fiancé, Andy, 51, I flicked through the TV channels. ‘Oh no, do we have to watch this again?’ Andy groaned. Obsessed, I’d made him sit through the romantic chick flick at least 30 times before. ‘You know how much I love it,’ I smiled, jokingly fluttering my eyelashes. ‘Fine then,’ he sighed, caving in. There was no denying Andy was a sucker for the hit soundtrack as he tapped along to the music, but my favourite part of the whole movie was the final scene – with the dance routine and iconic lift to ‘I’ve Had The Time of My Life’. It never failed to make me cry tears of joy. Andy and I met at work at an engineering company. Both married at the time, we were just friends and we’d usually have a cup of tea in the kitchen on a break and used to chat when I gave Andy a lift to and from work as he lived around the corner from me. It was only when Andy’s marriage broke down and I went through a divorce a few years later that we started to see each other in a different light. We got talking on a work night out and there was no denying there was a spark. Keeping our relationship a secret from the rest of our colleagues at first, it wasn’t long before the word got out, but they were thrilled for us. I introduced Andy to my grown-up children, Ryan, 28, and Lauren, 22, and they got on like a house on fire. I adored Andy’s kids from his previous relationship Aaron, 28, Sophie, 26, and Shelby, 22, just as much. Our families spent Christmas Day together and I prepared a traditional roast dinner with all the trimmings. We tucked into a feast of turkey, roast potatoes, pigs in blankets and Yorkshire puddings. ‘This is delicious,’ Andy grinned. I cleared away the plates and as I stepped back into the living room, Andy dropped to the floor. Rushing over, I thought he’d fallen over. ‘Are you ok?’ I asked. But before I could help him to his feet, Andy pulled out a box with a sparkling diamond ring in it. He hadn’t stacked it – he was down on one knee! ‘Will you marry me?’ he asked. ‘Yes, of course I will!’ I cried, throwing my arms around him. We popped open a bottle of bubbly to celebrate. Andy had even arranged a party with all of our nearest and dearest a few days later. In January we started planning our wedding. We looked at venues and settled on Arnos Manor, Bristol, we drew up a guest list and started looking at colour schemes, flowers and favours. ‘It’s all coming together nicely,’ I said, ticking off another of the tasks on my to-do list with a flourish. In July we decided to go to the pier at Weston-super-Mare, Somerset, for a family day out. Andy’s brother, Simon, joined us with his wife, Jo, and her children, Kerri, Ben, Vicky and Caine. After a walk along the sea front, we stopped for a bite to eat and a drink in a pub nearby. A lovely sunny day, we sat out in the beer garden. ‘What are you going to have as your first dance?’ Jo asked Andy and I. ‘We haven’t even really thought about it yet,’ Andy said. ‘I think we should re-create the lift from Dirty Dancing,’ I giggled. Andy’s niece, Vicky, and nephew, Ben, got up to re-enact it. ‘Be careful,’ I called after them as they messed around. Vicky ran at Ben and he hoisted her above his head as she flung her arms and legs into the air. ‘You make it look easy,’ Andy scoffed. ‘You give it a go,’ they encouraged. We’d had a couple of glasses of wine and pints to help us muster the courage. Taking steps backwards, I prepared for my run up. ‘Are you ready?’ I asked Andy. ‘As I’ll ever be,’ he said, limbering up. Andy’s niece Kerri, 21, got the camera on her phone ready to capture the moment. Running at Andy at full pelt, I expected him to pick me up and fling me above his head just like Jennifer Grey leaping into the arms of Patrick Swayze in the 1987 movie. But Andy grabbed hold of my hips and tried to lift. 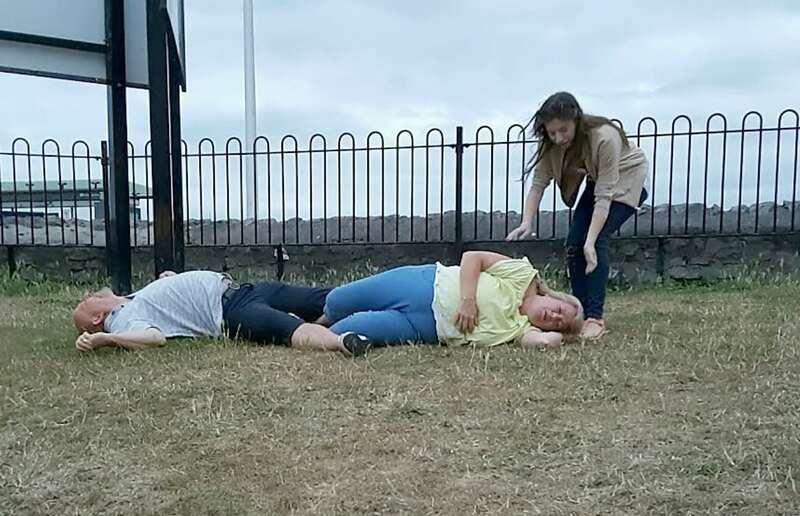 But instead of throwing me upwards we ended up flat out on the grass after colliding with each other. I felt Andy buckle under the weight and we both went crashing towards the floor. ‘Arrrghhh!’ I screamed, before landing like a sack of potatoes. Dazes, I was winded so badly I couldn’t breathe, while Andy hit his head on the floor so hard he was knocked out, sprawled on the grass – his legs tangled with mine. Our family were in fits of laughter, thinking we were playing a practical joke on them. But they soon realised we had seriously hurt ourselves as I gasped for air, trying to catch my breath and Andy came around feeling sick and they came rushing over. ‘Are you ok?’ Vicky said, worrying. Jo frantically called 999 and paramedics soon arrived at the scene. They put Andy in a neck brace and loaded him into an ambulance after cutting off his t-shirt. Switching on the blue lights, they rushed him to Southmead Hospital in Bristol. As he’d been unconscious, medics made Andy go for an MRI scan. I had been taken to hospital in a separate ambulance to be checked over. Luckily, I just suffered a bit bruising, sore neck and dented my pride, while Andy had a bad back. Doctors laughed when I told them how the accident happened and how our attempt at the iconic dance routine spectacularly flopped. We were finally sent home at 3.30am that evening. ‘Somehow I don’t think we’ll be trying that again,’ Andy smirked. Since our escapades the jokes have been non-stop from family and friends. They’ve teased us by saying ‘Nobody puts baby in the corner’ ever since. We’ve got no plans to brush up on our dance moves for the big day in October 2018. We still haven’t chosen which song we will have our first dance to, but it’s safe to safe it probably won’t be ‘I’ve Had the Time of My Life’. If you have a quirky, unusual, heartbreaking, or even bizarre wedding story or any other story, we want to hear from you. We exist to help you tell your story to magazines and newspapers. Highest fee guaranteed. Our service is won’t cost you a penny and there is no obligation. Sell Your Story today. Perhaps you have a video to go with your story, or you’ve just caught something incredible on camera and would like to sell mobile phone footage? Get in touch and we’ll ensure you get the highest payments possible for your footage. There’s no obligation and our service doesn’t cost you a penny. We’re here to help the entire national media fill their pages and websites each day. Simply fill out the Story Valuation form on this page to tell us a little about your story or video. One of our team will get straight back to you if we can help get your story out there. Nothing will be printed without your permission. You stay in control.